Best Sport Headphones Reviews. FX-Sport. Integrated Trainer. FX-Sport VRX Sport Headphones. Earphones With Built in Mp3 Player and Integrated Trainer. Customer Reviews. Premium sport headphones for running, for the gym and for swimming. Hundreds of customizable workouts preloaded! Click here for full details about the VRX Sport Headphones. 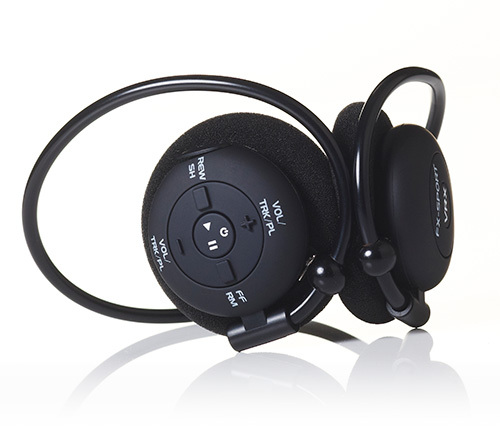 Click here for full details about the VRX Sport Headphones for Swimming. Click here for full details about all the preloaded workouts from the FX-Sport Workout Store. Click here for full details about all the FX-Sport Trainers. “Hi, my name is Janice. I live in Hartford. I’ve had this FX-Sport mp3 player for three and a half years now. It’s definitely the most used gadget I have ever bought. I use it nearly every day, on the commute to work, on the train and tube, listening to music. As a hobby, I am a Zumba instructor. So I use it a lot down the gym, practising the routines. I have a couple of clips to show you how I’m using this to practice a strong Zumba routine, which is some new music at high intensity, for interval training programs for Zumba from quite recently. So for me music is not just a background to my workout. I have to do the routine to the music. So it has been very handy. When I take it down the gym, because often the gym would have it’s own background music and it’s all background noise. So this would block out all this noise and I’m just playing my own music. It’s also very comfortable as well. Wearing this feels so light, so I don’t really notice that I’m wearing the headphones. I also take them on holiday every time I go away. So this particular FX-Sport mp3 player is well travelled. I would use it on the plane, I would use it at the hotel gym, practising. When I go on holiday I would have more time, so I would be at the hotel gym two, three hours at a time. I would feel, again, very comfortable wearing these and the battery life is also good. I don’t need to charge it during the two to three hours. “Hi, I’m just going to give you a little talk, my unbiased opinion, on the FX-Sport VR1 Headset [now VRX]. I purchased this a few years ago when I was down at a show and I saw it being fully demonstrated. I purchased one and not looking back, it’s the best thing I ever bought. I used to go for a run, quite regularly, using the old traditional headphones which you would get in your ear, then fall out if you were running or various things. So I saw these demonstrated – yeah, I’ll give them a go. So I had a long chat and had a think about it. Now basically they’re so easy to put on. They fold up, very very easy like that. They can fit in your pocket, you can hold them, you can put them in a bag. You can basically just put them…you’re not going to damage them, that’s what I’m saying. They’re very very flexible as you can see, very padded, they’ve got a bit of foam on there, with the controls quite easily seen on the top, all finger controlled, very nicely sized. So basically what you do is just pull it aside and you slot it over your head. Very very simple. It goes over, goes over like that and the padded bit sits on your ear. I will guarantee that you can do whatever you want, you can run, you can jog, you can do all your exercises, these will not fall off. They are absolutely great for stability. So gone are the days where these headphones fall out of your ears and you have to start picking them up and messing around. So that’s the first thing. The second thing is that these are literally charged up using a cable into the side of the headset, which has got a protective cover. You just basically fasten it in with your wire and you’ve got the USB cable at the end to fit into either the computer or a three point plug [wall plugs not recommended now!]. So once they’re fully charged, you can put those on the computer and download the FX-Sport system on your computer and you can put your programs directly into this. “My name is Annette, and I live in Charleston, South Carolina. I’m a paddler on the Charleston Dragon Boat Racing team, and I cross train with swimming, running, and cycling. I am using the VRX headphones for swimming laps and running five to six times per week, so I have been using them a lot since I’ve gotten them. I really like the headphones. I love the workouts that I’ve downloaded, and I notice that with the workouts, that my time goes so much faster. It’s fun to do the workouts, and I love having a trainer cue me with times and speed. The sound quality of this mp3 player is unlike any other mp3 player that I’ve had in the past. These headphones are the best that I have found to use for swimming laps. I can do flip turns, I can swim underwater, and it doesn’t affect the sound quality at all. The music that I’m playing is crisp, it’s clear, and it’s really fun to swim with them on. I don’t worry at all about them slipping off my ear, or that those little earpieces fall out like they do with traditional mp3 players. I found that the silicone cap is very easy to put on, and once you’re wearing it, it stays very secure under the swim cap that’s provided, or even my traditional latex swim cap. I have used both. “Hi, my name is Barry and I’ve been using the VRX sport headphones for a number of years now. I use the VRX at the moment and I’ve been getting great use out of it. The best thing about it of course, apart from it being so compact, is the wireless feature. It’s just the comfort of not having any cords getting in the way. I sometimes use the VRX for jogging and it’s always stable on my head when I run. I also use the vrx when I do Chi. With the spongy covers and it being so light, it’s so comfortable you’d hardly know you were wearing it. But I got the VRX mainly for listening to music. The quality of sound, the volume and the control features are all excellent. The eight gig capacity allows you to carry so much music, which means you don’t need to replace it so often. I do a lot of hiking and long walks and the five hour battery life is usually enough to see me through. By the way, I also have a Mi-Sport headphone, one of the first FX-Sport models to come out. I got this back in 2009, and it’s still working better than ever.